The crowd files into Hy-Vee Arena ahead of Vice President Mike Pence's scheduled rally. With days left before the Nov. 6 midterm, Vice President Mike Pence visited Kansas City, Missouri, on Friday to lend support to a host of Republicans who are running for office on either side of the state line. Some, like Kansas Secretary of State and gubernatorial candidate Kris Kobach and Missouri Attorney General and U.S. Senate candidate Josh Hawley, are locked in tight, tossup races against Democrats. Polls show others, like Kansas U.S. Rep. Kevin Yoder and Kansas 2nd District candidate Steve Watkins, may be in trouble. Missouri Gov. Mike Parson kicked off the event, which sponsored by the American Conservative Union and held at the Hy-Vee Arena. 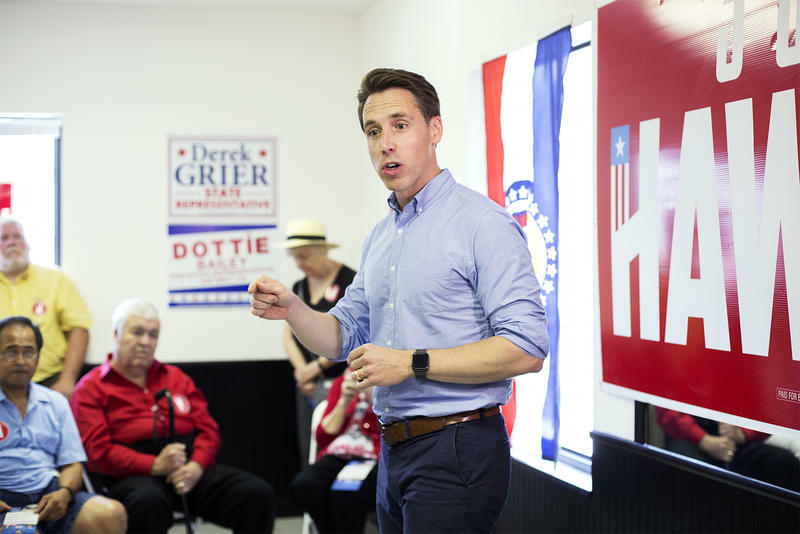 "He's the rising sun for us here in Missouri," he said of Hawley, "and I think of Claire (McCaskill) as the setting sun. Time to go home, time to ride off in the sunset I what I say." Kobach also spoke, saying there was a lot at stake in the election and contending that Kansas is lagging behind its neighbors in economic growth because of taxes. He also defended his record on voting rights and immigration policy. Kobach encouraged those in the crowd to make sure their family, friends and neighbors vote. The event was an intimate setting with only a few hundred seats, compared to President Trump’s appearance in Columbia on Thursday in an airport hangar. Trump is scheduled to go to Cape Girardeau, Missouri, on Monday to stump for Hawley as well. Other party leaders were also in attendance in Kansas City, trying to shore up their base's votes. House Majority Leader Kevin McCarthy, a California Republican who's in the running to become House Speaker if the GOP retains control of the chamber, mentioned an immigration bill, which prompted chants of "build the wall." Hawley, who compared McCaskill to Hillary Clinton, introduced Pence. The vice president told the crowd that things are going well for Republicans on a national level. "You look around this country and you can just feel it, can't you? Confidence is back ... in a word, America is back, but we're just getting started," he said. Trevor Cartwright, a teacher at Northland Christian School in Kansas City, brought his government class to the rally. "We had a great opportunity come up and we were able to make it happen this week," he said. "And we thought, 'Why not go see the vice president?'" He said some of his students are following the U.S. Senate and other races. "We've talked briefly about it. Some of them aren't of voting age yet, but ... the ones that are have expressed an interest to go vote," he added. Democrats have their own get-out-the-vote efforts this weekend. Kansas gubernatorial candidate Laura Kelly will make appearances with former Gov. Kathleen Sebelius, who also was President Barack Obama's Secretary of Health and Human Services. Incumbent U.S. Sen. Claire McCaskill has a rally scheduled with U.S. Rep. Emanuel Cleaver, also up for re-election, and state Sen. Kiki Curls in Kansas City on Saturday. Incumbent Republican Congressman Kevin Yoder and his challenger, Democrat Sharice Davids, faced off in a debate on Tuesday afternoon, just a week ahead of the midterm election. Both are vying for a seat in the Kansas 3rd congressional district, and Tuesday's debate was the first time the candidates had met in person. Yoder called attention to this in his opening statement, accusing Davids of skipping debates. The polls in Missouri will be open from 6 a.m. to 7 p.m. Tuesday. There’s been a lot to keep up on a national and international level, so if you don’t feel quite as informed as you’d like about what’s on Missouri’s ballot, don’t fret. The following is a rundown of the state’s biggest races — especially that contentious U.S. Senate contest between incumbent Democrat Claire McCaskill and Republican Attorney General Josh Hawley — plus a breakdown of several major issues that voters will be asked to decide.